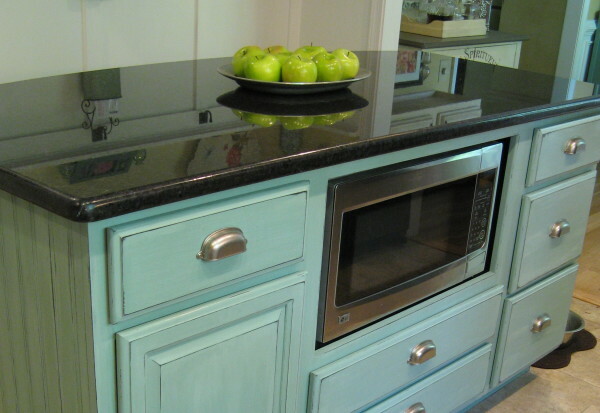 You don’t have to hire a professional to paint your kitchen cabinets! With the right tools & paint, anyone can do it. 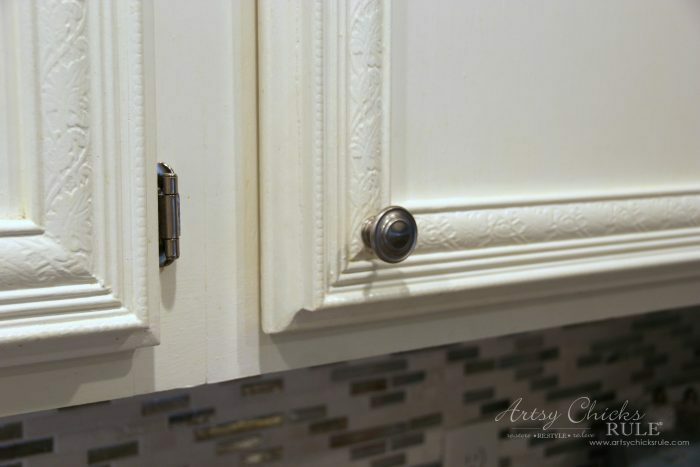 I’m sharing how my Chalk Painted cabinets have held up, 4 years later. I’ve been meaning to get around to this post for a very long time. It’s been sitting in my “draft” folder just waiting for me to write it, titled and all. So today is the day I thought I’d tell you how my Chalk Painted Cabinets have held up over the years. And the answer is…..pretty darn well. 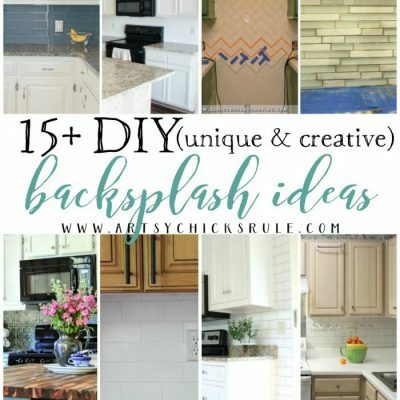 If you are new around here, I painted my kitchen cabinets with Annie Sloan Chalk Paint over 4 years ago now. 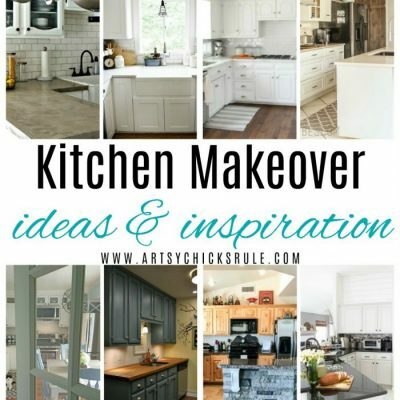 You can read all about that right here, “Kitchen Cabinet Makeover with Chalk Paint“. 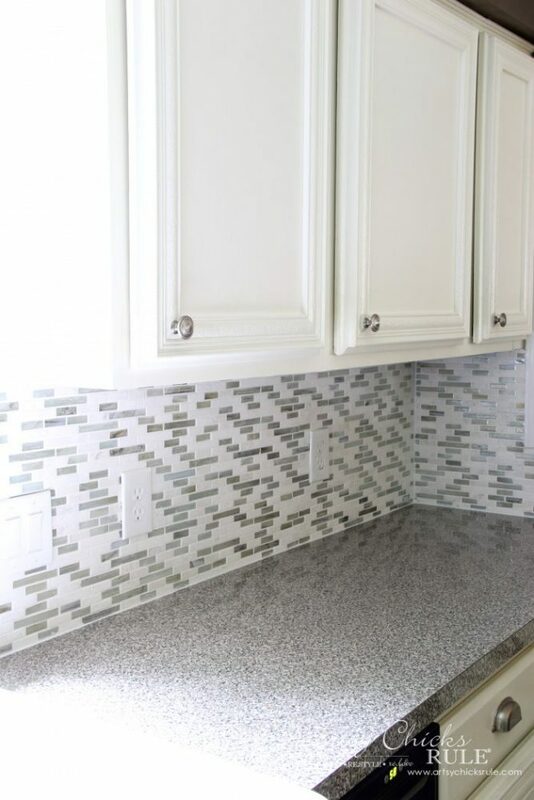 These are a few photos from my recent kitchen tile back splash project. But you can see the cabinets and how well they look. I also have a Chalk Painted kitchen island. Now let me preface this by saying, I did not use wax to seal these Chalk Painted cabinets. AND I would not recommend using wax to seal cabinets in a kitchen at all. It’s just too much upkeep (and work, let’s be honest, waxing is not the easiest thing to do). 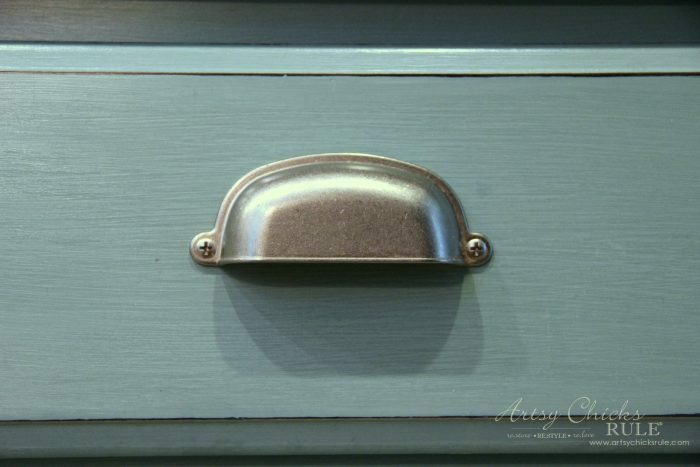 I painted and waxed (with Annie Sloan Clear Wax) this little bread box that I use in my kitchen. I’ve had to re-wax and buff it multiple times since having it in here (which is about the same time frame). Can you imagine if I’d waxed all these cabinets and island? It’s also got a few small nicks here and there. The finish is just not durable enough, in my opinion, to use in a high use area like a kitchen. Plus it tends to look “smudge-y” from all the hands on it. What I did use (and recommend) is a poly sealer. I used Varathane sealer that was made for flooring. As a matter of fact, we used it on our wood floors when we refinished them sometime before this. It was so rock hard there I thought it’d be perfect for my Chalk Painted cabinets. That stuff is rock hard and why I probably had little noticeable wear. I was hoping it would not yellow but sadly it did ever so slightly. If you look at the post I linked at the beginning of this post, you will probably not be able to tell much difference at all. Like I said, very slightly, but enough that I can tell. Definitely not as bad as others I’ve used in the past but still just a bit. That is one of the reasons I’ll be repainting. And the other reason is because I didn’t paint them white-white from the beginning so they started out a bit on the warm side, poly or no. Now, let me say that it’s hard to find a good sealer that doesn’t yellow a bit. I’ve yet to find an absolute perfect one. Another that I like quite a lot is General Finishes High Performance Top Coat. I’ve had pretty good luck with it. Even though I plan to repaint them, I have to say, I’m quite impressed with how well they’ve held up. However, the paint I applied originally after moving in (regular latex with a glaze over top) also held up very well. I had no chipping or wear in that paint either but I soon grew tired of the glaze which ended up just looking “dirty” to me. 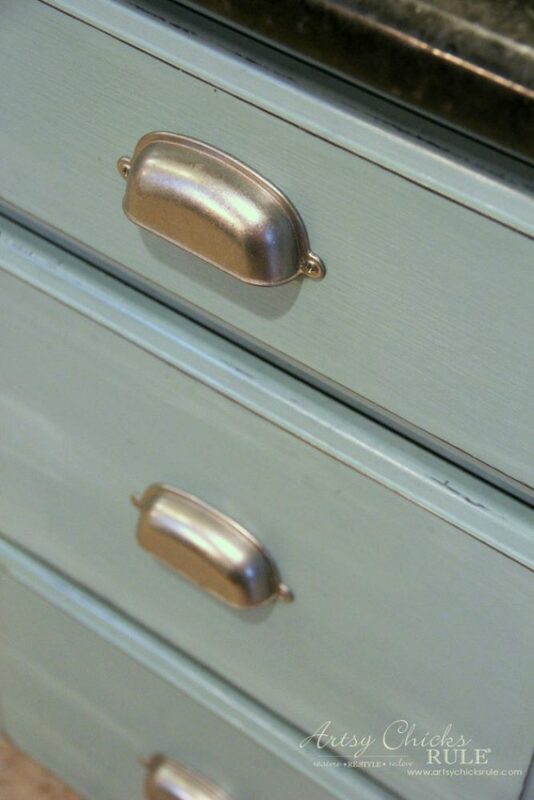 I’ve also had no chipping and wear in this Chalk Painted cabinet finish either….except in one place. 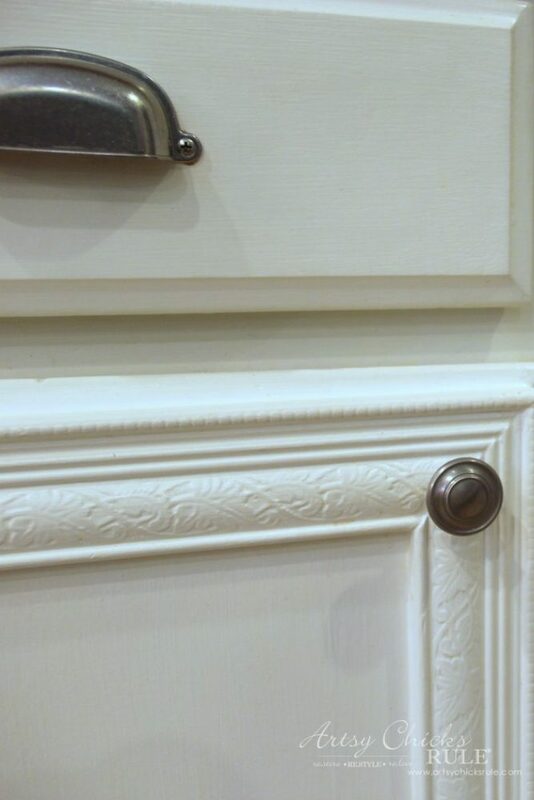 The handle above is the silverware drawer. Obviously one that is used often….and you can see the paint is in great shape. Down below, well, we have quite a few nicks in the paint at the top of the door. Not really paint wearing away, just the nicks. This is where our trash can is and the handle is honestly a bit to low to use…..so guess where we open it?? Yep, hands and nails end up hitting that top area to pull it open and have nicked it over time. But that is honestly the only place in the entire space that has any kind of wear or nicks. I will be putting a different type of pull (and moving it up closer to the top) when I repaint the island. As you can see, looks pretty great. I do have a few spots like this (below) here and there. Not sure what’s going on here but I’m guessing something spilled and stained it. It doesn’t go away (dry) and I can’t clean it away either. It’s stained and there for good. So that’s an odd occurrence I’ve never seen with regular, more traditional paints. I don’t see this at all on the whiter Chalk Painted cabinets, however, only the blue. Here is the cabinet right by the sink that holds vitamins, aspirin, etc. One we go into daily. 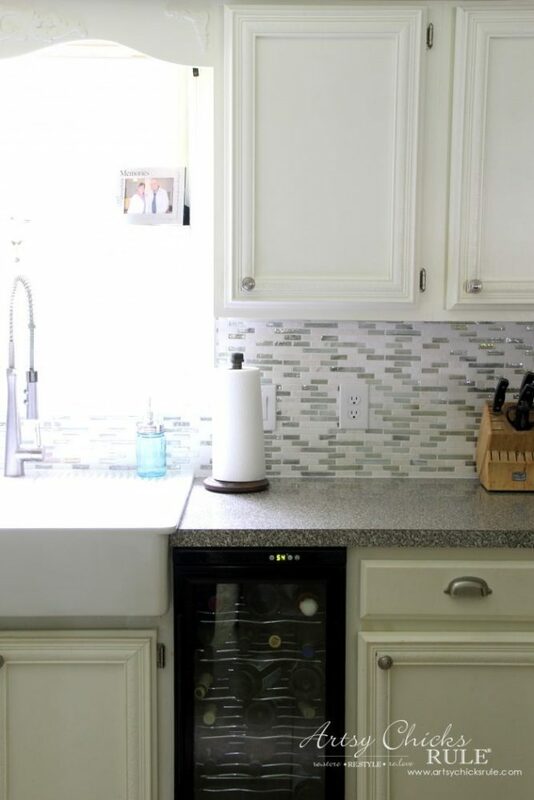 To the right of that is the cabinet that holds spices, some plates and glasses. I’ve not done any retouching since they’ve been painted….anywhere. No wear whatsoever around any handle, cabinet edge, etc. 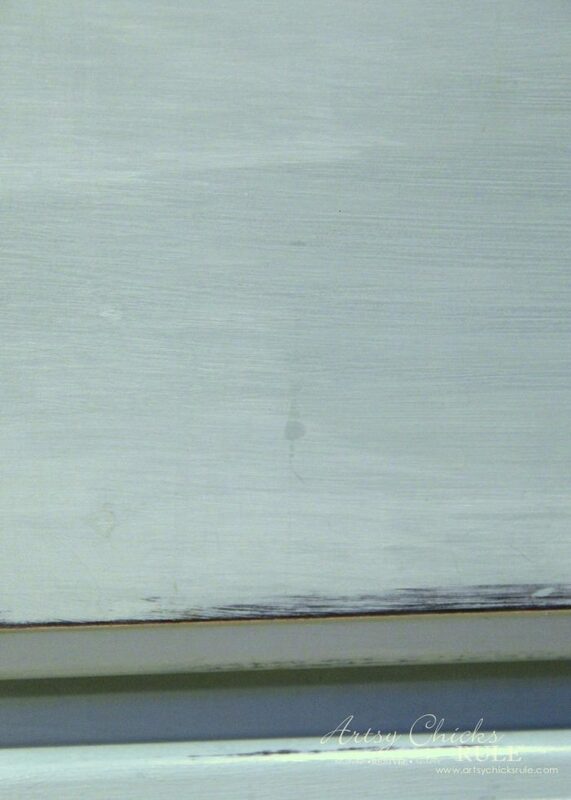 You may be able to see that the seam between the trim (and the door) we applied to the cabinet is cracking a bit. But that really doesn’t have anything to do with the paint. I’ll lightly sand and re-caulk that area before I paint again. Another cabinet and drawer that is used often. So, as you can see, not too bad at all! 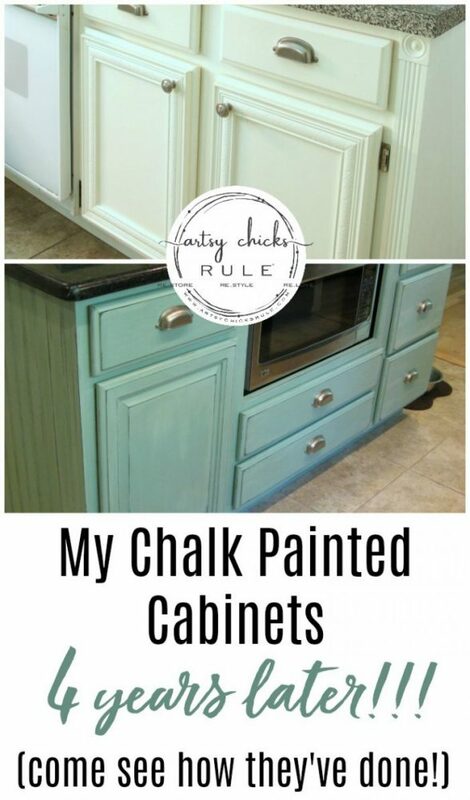 I wouldn’t hesitate to recommend using Chalk Paint on your cabinets. Some things to keep in mind. Chalk Paint tends to leave strokes or not be as smooth as latex. You can counteract that by lightly sanding in between coats. And on your final coat before applying your sealer. And another thing, just because you are using Chalk Paint, it does not mean that they have to be “shabby” looking or distressed. It’s just paint like any other paint. (relatively speaking) So, paint and distress or paint and don’t distress. Now, what am I using to repaint the cabinets and island?? It won’t be Chalk Paint this time. Not because I wasn’t happy with it but mainly because I also love another paint and want to give it a go in here. The paint I’ll be using is General Finishes (in Snow White). A nice, bright white. I’ll also be using it for the island. The color is undecided but I’m considering Persian Blue. My thoughts and real life experience with Chalk Painted cabinets. Have any questions? I’d be glad to answer or help any way I can! To catch up on what we have going on, check out the posts below…. I’ll see you back here on Thursday! 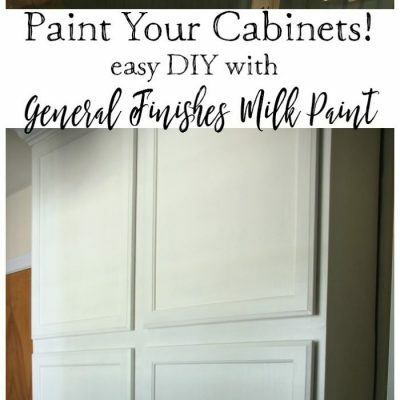 I’m wondering how you plan to prep your cabinets before painting with the General Finishes paint. Is it like the chalk paint, where it will adhere to pretty much any existing finish, or will there be priming or stripping involved? Hi Judy, I will probably do a very light sand by hand (and I do mean, light, as in a quick run over with the sandpaper) I may also use liquid deglosser. None of that is really necessary since it’s also basically a “no prep” style of paint but I don’t see the harm in a little added protection. :) It is like Chalk Paint in that it doesn’t require much prep beforehand but the product itself is a bit different. i love General Finishes High Performance topcoat…I use it often. Wax has almost become a product of the past for me. However, I have not been as successful with using GF Topcoat over (Their) white. I have had yellowing almost instantly. Just knots my stomach but I just “fix” it and move on. Your cabinets look so nice. Isn’t chalk paint so easy to apply? Pretty kitchen! I just have a short and positive story about chalk paint. 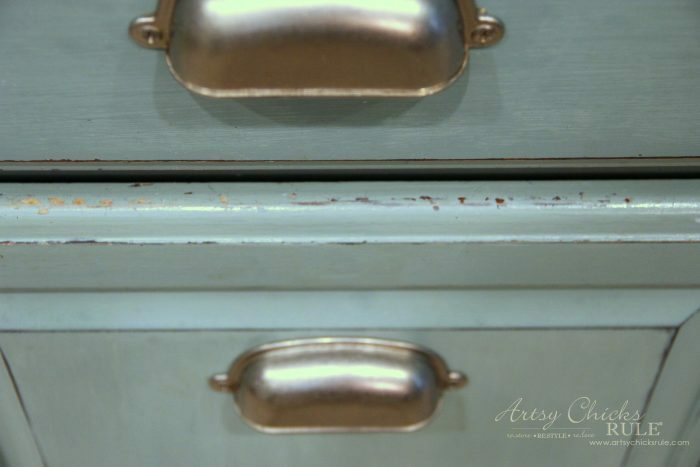 I took an old tan metal filing cabinet in my office and put chalk paint on that. Really pretty one year later. The cabinet was washed first, I did not put ANY wax or finish on it and I used metal! Keep in mind it’s being used by one adult only but it’s working out great. Thank you Lori! And yes, it is and the no prep can’t be beat. That’s an awesome story and a testament to the power of Chalk Paint! :) Thanks for sharing!! I did use wax on my AS chalk painted cabinets and they are fine. However on the island you can see where hot dinner plates sit. The wax actually changed texture. I now use General Finishes Flat Out Flat top coat. I’ve had great luck with Junk Gypsy Clear Coat. It’s water based, tough as nails and doesn’t yellow. I used a polyurethane over duck egg blue on my kitchen chairs and it yellowed and looked awful. I’m redoing them now with Fusion Mineral Paint, which is my new favorite. I had horrible results with my ASCP kitchen cabinets. After reading your posts four years ago, which seems crazy that I have been following your blog for over that long, I decided I could handle painting my cabinets. I followed all of your steps and used the same topcoat. We have so many splatter marks especially around the stove area that the cabinets look terrible. I will say they have held up as far as minimal nicks except on the silverware drawers. If I had the money I would have someone else come in strip the doors and repaint it all. 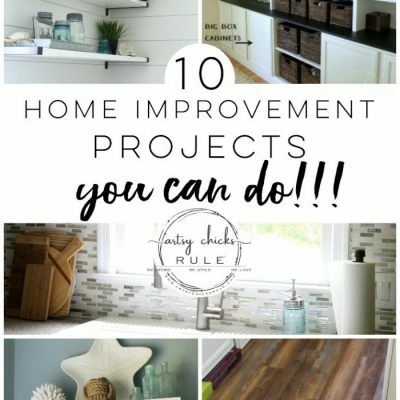 I can’t thank you enough for helping others by giving such complete and straight forward instructions on how you have achieved the look to the final project pieces shown on your website. I doubt myself but after reading your explanations, that are easily detailed out I feel more at ease and in turn this gives me the confidence needed that I will be able to complete a similar project. 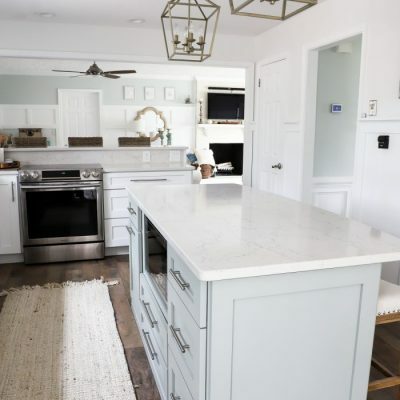 I am planning to paint my cabinets this fall and taking your recommendation of using the Varathane poly to seal them… I am wondering what sheen you used or would suggest for kitchen cabinets, semi-gloss or satin? Thanks for all the great tips! 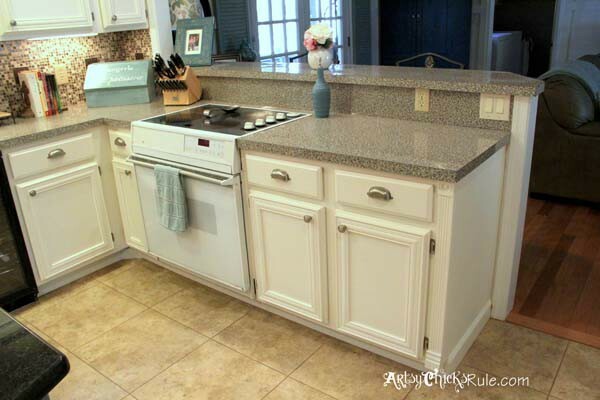 My cabinets are formica… would the chalk paint still work? thank you for such a prompt reply Nancy ! there are only 2 of us using the kitchen and the cabinets as i said are formica (off white) prob 30 years old – we are not able to do a makeover yet for new cabinets and counter so i am just going for it ! would you suggest something other than sanding lightly and using General Finishes paint ? You are very welcome. Sounds good! I don’t blame you, I would do the same! Wait, I did! ;) We didn’t replace ours either so paint it was! 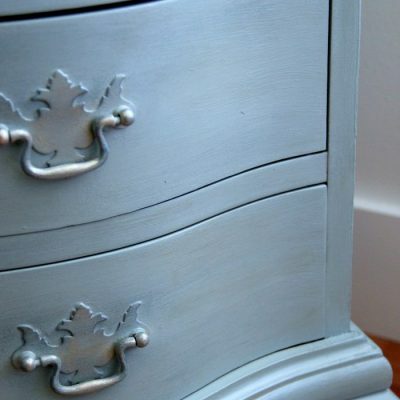 You can use either General Finishes Milk Paint (in the can) or Annie Sloan Chalk Paint. I like both and both perform similarly. You could use a primer such as something called “Gripper” but I really can’t speak to it because I’ve not had the need to ever use it. Even with that, I would still recommend the sanding though. I think for your purposes, you will be okay with sanding (cleaning very well) and painting with either of the paints mentioned. Chalk Paint may hold up a tad better over the formica material. Hope this helps and good luck!! thank you again for the very quick reply ! 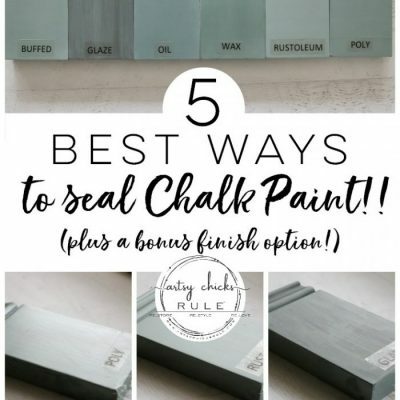 May I ask how much paint you used when you painted with the chalk paint? How many coats? And how much GF paint you expect to use? How many coats? I’m trying to work up the courage to paint my small condo kitchen. I love GF Top Coat and will try that. Just hunny bunny & i.
Hello I just love everything you’ve done & love that you show all your work right here for all of us to learn from! Thank you so much for that! I am in the middle of my kitchen cabinet painting project as well. I am painting with ASCP in Old white but might have to add some pure white since it’s a bit too yellow for me. I was wondering about which topseal you prefer & why? I know you used Varathane poly top coat on your cupboards previously & was wondering why you’re switching to GF high performance top coat this time around? Hi Isabelle! thank you! :) Yep, definitely consider adding white to it if you already think it’s too yellow. And also keep in mind that a poly topcoat will yellow it even more, even if it’s just a little bit. I loved the Varathane as it really is rock solid but I also love the GF HP topcoat. I’ve had great luck with that, too. Here’s what I’ve found using the GF HP, as long as you don’t apply heavily or allow to collect in the corners, you will have very minimal yellowing. That is where I have seen a slight bit of yellowing (where it collected too much in a corner. And just know that if the cabinet gets a lot of sunlight, it will also be a bit more prone to yellowing. Not only that, but the types of wood/old paint you are painting over can also have an effect on this. They can all contribute to the yellowing. You can “tint” your top coat with a small portion of the paint to help avoid this even more. Hello. I would love advice on painting kitchen cabinets. This is for a beachy cottage. The kitchen needs to be remodeled but not possible at this time. Rethinking chalk paint after reading your article on chalk paint. It sounds as tho milk paint might be a better choice? This is a very small kitchen. I do not mind sanding and prepping. Oh, this is a rental. Still have pride in my place. 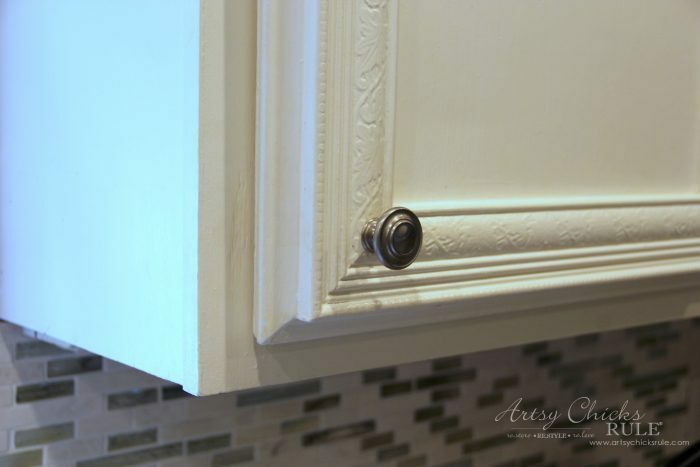 Thank you so much for sharing how your cabinets have held up. When we moved in to our home two years ago the previous owner painted the Oak cabinets almost black and they had chips all over. I recently painted them white using the Annie Sloan chalk paint and waxed them after as I heard the poly would yellow. I have already chipped the one garbage drawer and our cabinet we keep our coffee in as we go in and out daily. I was not aware wax would need to be re-applied, can you put a top coat over the wax as I don’t want to have to keep touching up my cabinets. I am also hesitant as I don’t want them to yellow two of them are on each side of a window. What would you suggest? Thank you for your quick response and letting me know I will need to sand them if I ever re-paint. Love all of your ideas, keep them coming! Did you use a brush to apply the top coat? Or can you use a foam roller or brush? So I’m using chalk paint for my laundry closet cabinets linen white Rust-Oleum. In the past I’ve used the same paint on a dresser and done the spray matte fishing’s on it. I haven’t really gone back and noticed if it’s yellowing or not (I’ll have to check now that I’ve read your post). I’m with you on using the spray it will leave a blotchy finish speacially on certain types of colors like grey (which I’ve used on another dresser/nightstand). So anyways back to my laundry cabinets… 1) should I Seal them or not? Liquid or spray sealer? If I understood your post you were a no on sealing kitchen cabinets because of the high traffic area correct? And not sealing them would be an easier process for touch ups if needed later right ? 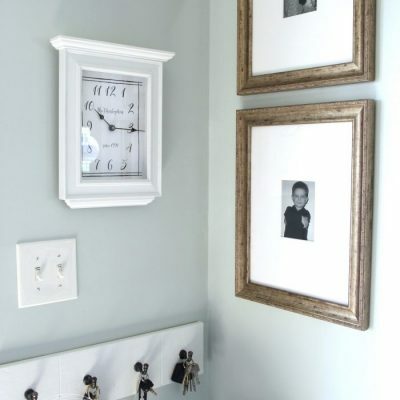 2) have you ever done chalk paint on walls? Sealer or not? 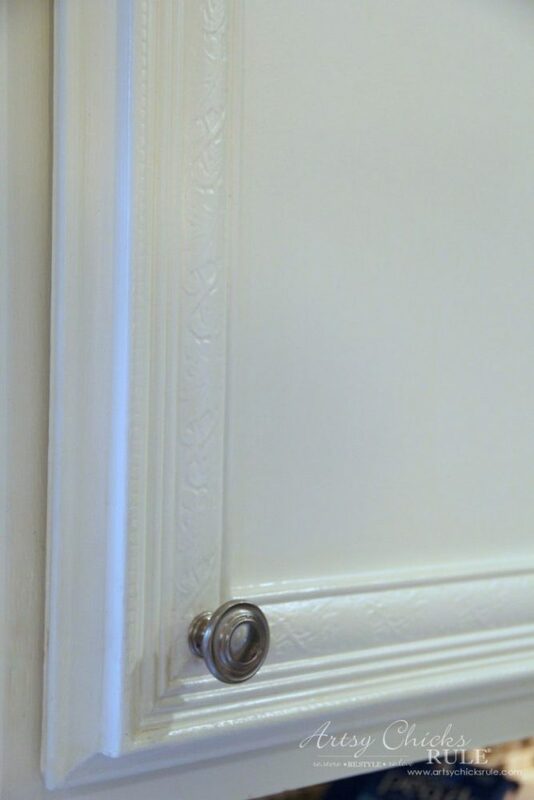 3) have you ever done chalk paint on doors/ crown molding ? My laundry room has a cream color off white trimming? so I was thinking of painting that along with the cabinets as well? 4) Brush or foam roller. So far I’ve noticed the brush has more of an all cover results (obviously at the trimmings and areas that are not flat). I used the roller on the outer walls of the cabinets and noticed it didn’t cover as well as the brush did on the doors. But it could have been that I didn’t use enough paint??‍♀️? Anyways I also noticed little tiny I guess bubbles (basically uneven?) when I used the roller, is this normal or was it the lack of paint I used? Okay, so let’s answer your questions. 1. Yes, you should definitely seal them. I would use liquid because the spray is tough to use inside and doesn’t give even coverage like the liquid will. And I’m sorry for the confusion, but absolutely seal the paint (in the kitchen or elsewhere). I think what you might have gotten confused about is I didn’t use wax to seal them, which is more typical with chalk paint. I used a poly to seal them instead, which is what I said I would recommend in a kitchen or bath area. (I don’t recommend wax in those areas) If you wax, I don’t think it will hold up as well over time and you’ll have lots of touch ups to do! 2. I have never done chalk paint on walls. 3. I have not used chalk paint on trim and doors. You certainly can if you want it to match, just know you will have the extra step of sealing it. 4. You can use either and I have used both at different times. When I paint cabinets I actually use both at the same time. I will use the brush to cut in and apply, and the roller to smooth out. Make sure you are using a good foam roller that is made specifically for painting cabinets. Try to roll it slowly so you don’t create as many air bubbles in the paint. You can always sand it very, very lightly after the paint dries (and in between coats) to smooth it out a bit before applying the sealer coat. Hi Nancy, love your blog. I have just bought an old kitchen hutch that had been newly chalk painted white before I bought it but hadn’t been sealed. I was going to wax it, but after reading your blog I will use a poly instead. I’m in Australia so brands will be different but I will try to find one that won’t yellow over time. We recently painted our pitched timber lined ceilings, we used Rustoleum Linen white, but it was pretty expensive as we have a large area and one coat wasnt enough so we decided the chalk paint was now the base and we painted two more coats with a regular paint. Hoping the timber doesn’t bleed through in years to come. They look good so far. Thanks again for the information in your post, Jennie ?